Ohio Wesleyan University currently maintains two forested nature preserves, which serve as outdoor facilities for teaching and research. Each preserve was donated by a family interested in preserving the integrity of the land in the foreseeable future. The Bohannan and Kraus Preserves, each named for its donor family, are both located in Delaware County, and between them provide a fascinating perspective on the range and diversity of habitats and wildlife within the modern temperate forest ecosystem. While the preserves remain as undisturbed as possible to maintain their natural character, they are used for field trips during scheduled lab periods, as well as for student and faculty research projects. Many of the natural science classes at Ohio Wesleyan visit these areas regularly as part of the laboratory experience. Laboratory classes engage in a wide variety of projects ranging from surveys of microbes, plants, fungi, invertebrates, and birds, to carrying out experiments designed to test specific hypotheses about natural ecosystems. 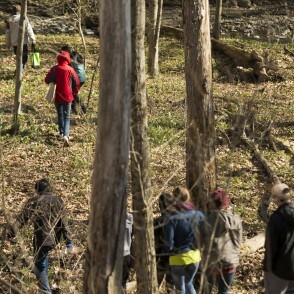 In addition, many students in Botany-Microbiology, Chemistry, Geology, and Zoology receive course credit for conducting independent research at the preserves. The Ohio Wesleyan nature preserves are used for the purposes of scientific education and scientific research. As dictated by the Kraus and Bohannan families, the preserves are to be maintained in their natural state. Any management and monitoring done at the preserves attempts to minimize human impact and facilitates opportunities for scientific study. The Bohannan Preserve is a 55 acre site with old growth beech-maple woods set within a larger forest that sits upon Ohio Shale bluffs overlooking terraced floodplain woodland along Alum Creek. This location is less developed than other areas of the county and, therefore, offers research opportunities in a less disturbed landscape. The preserve has been used for numerous Ohio Wesleyan student projects, including some done in collaboration with Ohio State and Miami of Ohio graduate students. Recent research topics have varied from population studies of the endangered narrow-leaved toothwort and investigations of the reproductive biology of goldenseal and violets to fiber-optic photography of plant root growth and GPS mapping. The history of this preserve began in 1954, when Elizabeth and Robert Bohannan purchased several contiguous tracts in northeast Delaware County. In their search for ways to ensure that some of the property would be preserved in its natural state, the Bohannans contacted Nature Conservancy. This organization provided information that led them to the possibility of donating part of their property to Ohio Wesleyan University. They then conferred with Dr. and Mrs. John Kraus, who had given the University land for the Kraus Wilderness Preserve. In 1981 the Bohannans provided 55 acres of their land along Alum Creek to form the OWU Bohannan Nature Preserve. The 80-acre Kraus Wilderness Preserve was transferred to Ohio Wesleyan in three separate installments between 1977 and 1997. It is composed of mature beech-maple and oak-hickory forest, transected by a deep ravine through which runs a section of Wildcat Creek. There are two ponds within the preserve boundaries. A field lab is also located on the property that is used for biology field labs and student-faculty research. The property is located in a mostly developed suburban residential area with a water treatment plant bordering it to the north. This location facilitates research that focuses on the natural woodland, pond, and stream ecosystems within Kraus, as well as the impacts of development on these ecosystems. An endowment established by Dr. and Mrs. John Kraus supports student research in the form of up to six annual fellowships. This fellowship program promotes student research at the Kraus Preserve and has supported projects on soil microbiology, deer browse effects, fungal endophyte-plant interaction, and amphibian, bird, small mammal and invasive plant population surveys.